Huge Savings Item! 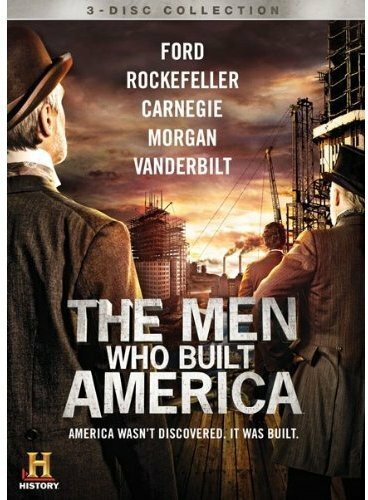 Save 20% on the The Men Who Built America [DVD] by Lionsgate at Chocolate Movie. MPN: unknown. Hurry! Limited time offer. Offer valid only while supplies last. John D. Rockefeller, Cornelius Vanderbilt, Andrew Carnegie, Henry Ford and J.P. Morgan rose from obscurity and in the process built modern America. John D. Rockefeller, Cornelius Vanderbilt, Andrew Carnegie, Henry Ford and J.P. Morgan rose from obscurity and in the process built modern America. Their names hang on street signs, are etched into buildings and are a part of the fabric of history. These men created the American Dream and were the engine of capitalism as they transformed everything they touched in building the oil, rail, steel, shipping, automobile and finance industries. Their paths crossed repeatedly as they elected presidents, set economic policies and influenced major events of the 50 most formative years this country has ever known. From the Civil War to the Great Depression and World War I, they led the way. If you have any questions about this product by Lionsgate, contact us by completing and submitting the form below. If you are looking for a specif part number, please include it with your message.